We have just returned from an 8 day stay at this hotel and the main negative point was the being woken at least 4 times during the night, people coming in and slamming doors and talking, this was until 4 AM in the morning. Towels changed every 2 days and our bedding was not changed once. We were in room 414, very basic, but surprised to have a fitted carpet in room albeit a brown colour. This room overlooks the square where all the revellers are, open the window and it's noisy,closed it's not too bad. There was a small fridge and a TV (small) but no other amenities, not in this room anyway! For all the tea lovers you'll get a nice pot of tea at Sir Harry's Bar on the square and most of the eating places are on par with one another. The Strip is easily accessible if you go up the escalators near the beach and get the little Road Train, get off at the second stop, walk down to the third stop and you'll find a small beach and places to sit and look at the sea. Vila Recife is a basic accommodation, but it is great value for money and always very clean. The location of the accommodation is great and it is only a 5 minute walk to the beach and main square. There are steep hills down to the square and beach so it isn't great for people with walking difficulties. We booked our holiday through Your Holidays and we cannot fault them, from giving us a great price to excellent after care, once the holiday was booked. I would highly recommend them and we will definitely be using this company again. Hotel tip: Brilliant hotel located very close to the square, where you will find a large number of restaurants and bars. A week of bed and breakfast at the Vila Recife was fine. The room was a good size, and we were pleased to find we had a fridge (also a kettle if we had wanted to use it), and basic crockery and cutlery. The air-con was a God-send. The room was kept clean, and linen changed regularly. We were situated on the same level as the swimming pool, which meant that we were not able to use our balcony without sitting right behind sunbathing guests, but this was not a great problem, as the gardens provided us with a pleasant sitting-out area. The one-way glass in the windows gave us privacy. A low cost hotel, giving excellent value for money. Breakfast was not even what would be classed as continental and never varied once in three weeks. No toast, watery orange squash not juice, processed slices of ham and cheese and bread rolls if you got down in time. The maid changed the towels most days but the bedding was only changed about every third day. The bathroom was very small and only had a shower. The bathroom floor was mopped daily but the room was only done twice in the entire three weeks and we ended up dirtying the sheets when getting into bed as the floor was dusty and sandy. The lift is for two people with cases maximum and regularly was out of order. The woman on reception was pleasant and helpful but the breakfast waitress was most certainly not. There doesn't appear to be any night staff controlling the noise in the hotel and it's difficult to get a full night's sleep. The location is close to the town and beach about a 10 min walk. There was no entertainment and the bar closes at midnight at the latest. My 4 mates and me stayed here in March 2008 for my 40th. We all had a double room each on the 2nd floor. The rooms were very clean and had an en suite which was also spotless. the room had AC and twin beds. I stayed in Room 201, the view wasn't the best but I wasn't there for the view!! There was a small admin error when we checked in but Helen, who was magnificent, soon sorted it out. All of the staff in the hotel are very friendly snd helpful. Location wise its a 5 minute walk down hill to the old town square. I think this hotel id ideal for a short break and woudl reccomend it to anyone. A small intimate hotel with friendly, helpful staff. Looks like an old-fashioned converted manor house. It is basic and generally clean but some areas could do with a facelift. The breakfast is continental style and some items ie cereal tasted stale but the coffee and rolls were very nice. You can enjoy your breakfast sitting in the garden if the bar is too full (bar used as breakfast room). There is a small pool (no kids section) with a few sunbeds dotted around which gets the sun until around 3:30pm. If you want the sun after that it's a short walk to the beach via steps and a tunnel. There is no entertainment program and we didn't manage to find the games room. This wasn't a problem to us but a few families with young children found keeping them occupied in the hotel quite difficult. The rooms vary in size and facilities differed greatly between the two rooms we had- one room had no aircon,bath or balcony yet we paid the exact same rates.Rooms overlooking the pool are also above the Old Town Square so are more noisy than the rooms over the gardens. All in all it's a budget B&B and we would stay again if it was just the two of us using it as a base. Very nice hotel with great staff. The bar was nice and cozy. 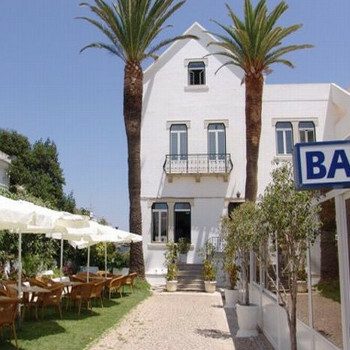 The location is great.. with just a fem minutes walk to the beach and the old part of albufeira. I defently recommend this hotel!